Most consumer drones come with a built-in camera or a harness to mount a Go Pro or similar camera. But if you’re a director of a big-budget Hollywood movie, you have other choices for difficult overhead shots. 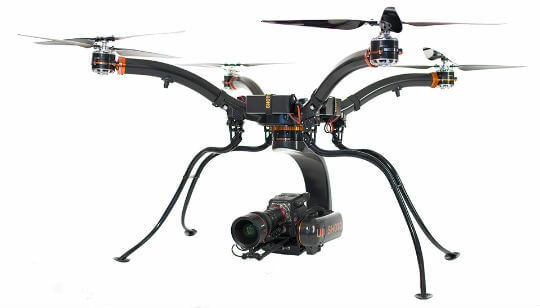 One example is the Shotover U1 drone, billed by its creator as the world’s first professional grade unmanned aerial vehicle (UAV) for the broadcast, motion picture, law enforcement and industrial survey markets. The Shooter was on display this week at the HAI Heli Expo trade show in Louisville, KY, where it shared the spotlight with helicopter manufacturers and their support services. The U1 is designed to carry cinema quality cameras and lenses made by Sony, Canon and other companies. When it begins shipping early this year, the U1 is expected to catch the attention of filmmakers who have already used Shotover’s gyro-stabilized camera systems on movies such as Jurassic World and Spectre. Shotover will also be used by the BBC for filming telephoto 4K footage of wolves, bears and caribou in Canada’s remote Northwest Territories for a six-part wildlife documentary series scheduled to air in 2016. You can get a closer look at he UAV - and put in a pre-order - at the Shotover website.